The ThINKin' Spot: A Pair of Sweet -n Sassy Digis, and GREAT NEWS!! Good afternoon! I'm a little late getting my post in today, but better late than never, right? I have a couple of cards to share with you today, both of which are made with Sweet -n Sassy digital stamps. Have you heard the news? Sweet -n Sassy Stamps is going to be releasing clear stamps again soon. Check out the website, and sign up for updates so that you can be one of the first to see what's coming!! Every Thursday is Sweet -n Sassy Digi Day on both Paper Craft Planet, and SNR Card Universe, and both of my cards today were made for the digi day challenges. The cocoa card was made for the challenge a couple of weeks ago, and little Miss Ladybug was made for yesterday's challenge. There's still time to play along for your chance to win a free digi. All you have to do is upload your card or creation by Monday, to get a free stamp. Pretty easy, peasy if you asked me!!! My Lilac Cocoa card was made with some scraps of K&Co. paper, and colored with Copic markers. All I added to this one was a punched lace border with my Martha Stewart lace border punch, and the oval and scalloped oval for the sentimen. Both the sentiment and punches for that come from Stampin' Up!. My Ladybug card was put together with yet some more scraps of designer paper from my scrap drawer. I've really been trying hard to check there first when I'm looking for paper, rather than get out a new sheet. I seem to be over run with scraps of paper that I REALLY need to be using up. I think I'm actually starting to make a little headway. Again, I used my Copic markers to color the image, and I used some Prima flowers and glittery accent pieces for the centers of the flowers. The sketch for this card comes from the Friday Sketchers Challenge Blog. I hope you are preparing for a wonderful weekend. We're looking forward to some warmer weather here, so that's going to be pretty wonderful in my book!! 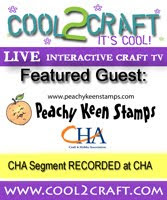 Thanks so much for stopping by today, and happy stamping to ya! ooo - so awesome! I love them both but really like the lady bug. I just think they are the neatest little bugs - so colorful and happy! Hugs to you sweet friend! These are both so cute Lorie! Love that black flowery paper on the ladybug card and the flowers go perfectly with the red paper! Your coloring on both of these is awesome! I love everything about your little mousy card! That background paper is awesome! It makes your image really pop out! awww I love your cards!Especially the first one! !Thanks for the inspiration!! Wow! I really love them both but lilacs are my fave soooo that stamp really stands out to me. BEAUTIFUL job on both cards! I love the layouts! Have a great weekend...here's hoping for warmer weather for you! Both cards are great, the lilacs are really pretty and that lady bug look so happy! Both of these are just as cute as can be!!!! I love, love, love the ladybug and the colors, papers, and embellishments on the card! Too cute! Cocoa is always adorable and with the lilacs...just as cute as can be!